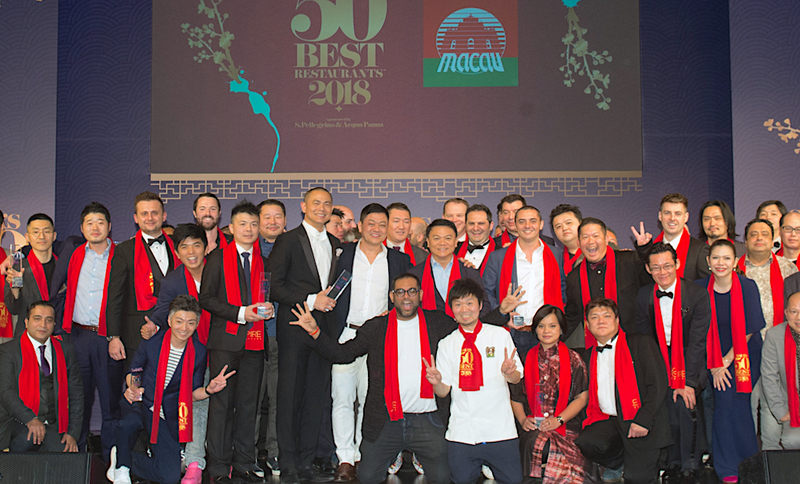 The 2018 list of Asia’s 50 Best Restaurants, sponsored by S.Pellegrino & Acqua Panna, was announced at an awards ceremony at Wynn Palace, Macao. Now in its sixth year, the 2018 list includes eight new entries, with Japan claiming 11 restaurants. Gaggan Anand’s eponymous Bangkok restaurant debuted on The World’s 50 Best Restaurants list in 2014, rising to No.7 last year. 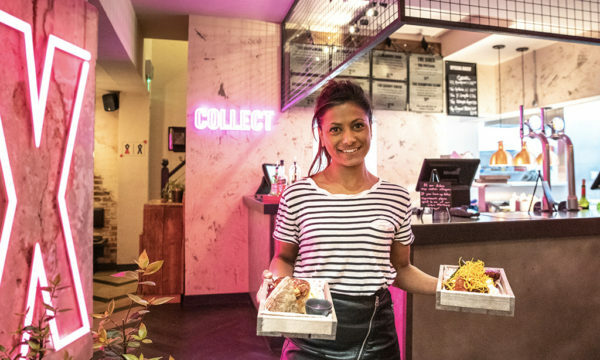 The 2018 edition of Asia’s 50 Best Restaurants list boasts nine Thailand entries, including newcomer Paste (No.31), headed by Bongkoch ‘Bee’ Satongun, who is also named elit® Vodka Asia’s Best Female Chef 2018. 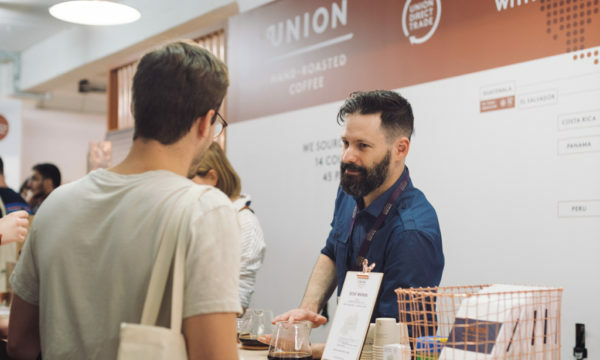 Other returning Bangkok favourites within the top 20 include Sühring (rising nine places to No.4), Nahm (No.10) and Le Du (rising 23 entries to No.14). Den (No.2) rises nine places to earn the title of The Best Restaurant in Japan, replacing five-time title holder Narisawa (No.6). The top 10 also includes Florilège (No.3) and Nihonryori RyuGin (No.9). Tokyo- based Il Ristorante – Luca Fantin is a newcomer to the list, landing at No.28. La Cime in Osaka makes its debut on the list at No.17, earning the Highest New Entry Award, sponsored by Aspire Lifestyles. With a menu dedicated to modern French cuisine, Chef Yusuke Takada sources local, seasonal ingredients to present dishes of impeccable style and refinement. Japanese chefs and restaurants were recognised in several individual award categories. Acclaimed chef Yoshihiro Narisawa is this year’s recipient of the peer-voted Chefs’ Choice Award, sponsored by Estrella Damm. For two decades, Narisawa has earned the respect of his peers with his refined dishes and ability to blend French cooking techniques, employ sustainable practices and honour Japanese culinary traditions. Ranked No.20 on the 2018 list, L’Effervescence in Tokyo has won the inaugural Sustainable Restaurant Award in Asia. 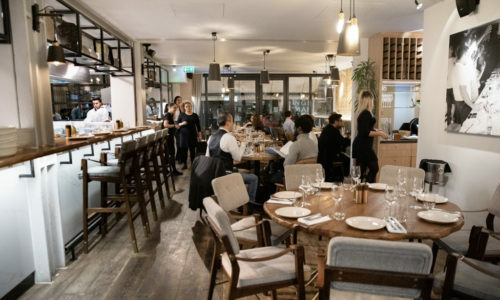 The award is given to the restaurant with the highest environmental and social responsibility rating, as determined by audit partner the Sustainable Restaurant Association. Rising four places to No.5, chef Julien Royer’s Odette claims the title of The Best Restaurant in Singapore. Singapore claims seven entries on the list, including Burnt Ends (No.12), Waku Ghin (No. 23), Les Amis (No.29), Corner House (No.36) and Jaan (No.44) as well as first-time entry Whitegrass (No.50). 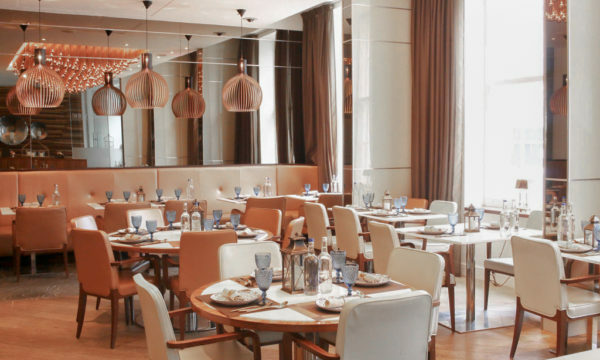 Amber (No.7) in Hong Kong is named The Best Restaurant in China for a third successive year. 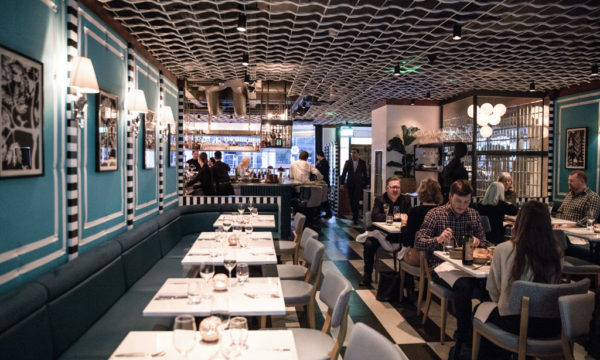 The nine Hong Kong restaurants on the list include such perennials as 8 1⁄2 Otto e Mezzo Bombana (No.13), Ta Vie (rising 17 places to No.16) and Lung King Heen (No.24), as well as two newcomers, Neighborhood (No.32) and Belon (No.40). 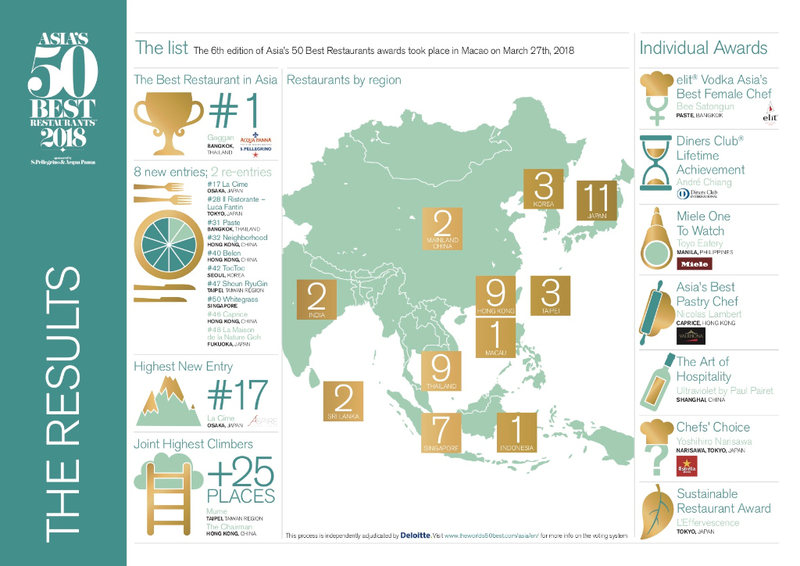 Hong Kong’s The Chairman (No.22) and Mume in Taipei (No.18) tie for the Highest Climber Award with both restaurants rising 25 places. 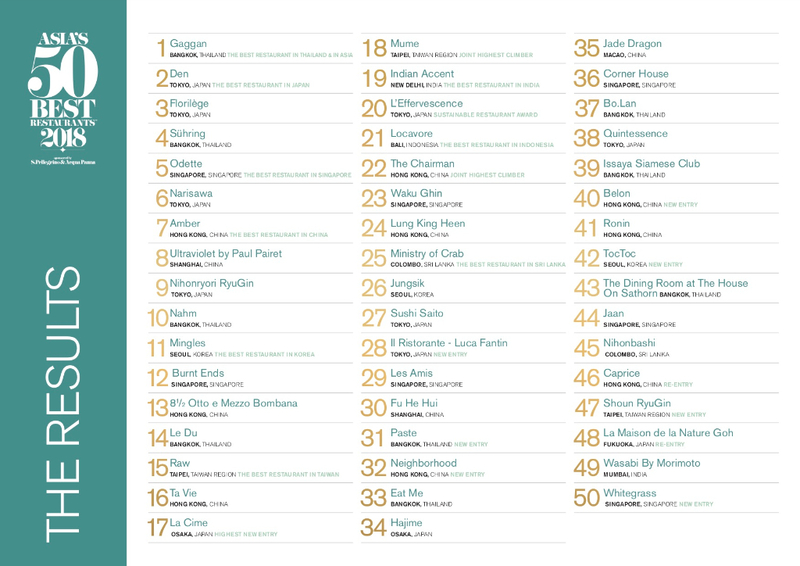 Macao is represented by Jade Dragon (No.35) while Mainland China counts Shanghai restaurants Ultraviolet by Paul Pairet (No.8) and Fu He Hui (No.30). 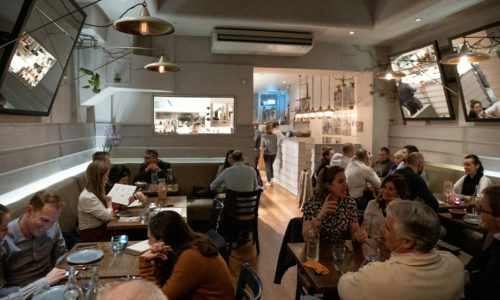 Mingles (No.11) in Seoul retains the title of The Best Restaurant in Korea. While Jungsik lands at No.26, TocToc, the 2017 recipient of the Miele One To Watch Award, enters the list at No.42. 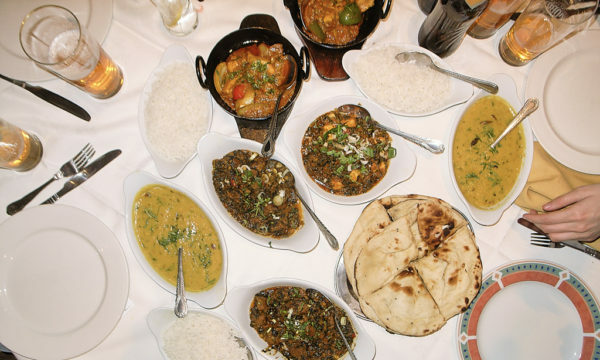 Locavore (No.21) in Bali keeps The Best Restaurant in Indonesia honour while Indian Accent, rising 11 places to No. 19, is awarded The Best Restaurant in India for the fourth time. 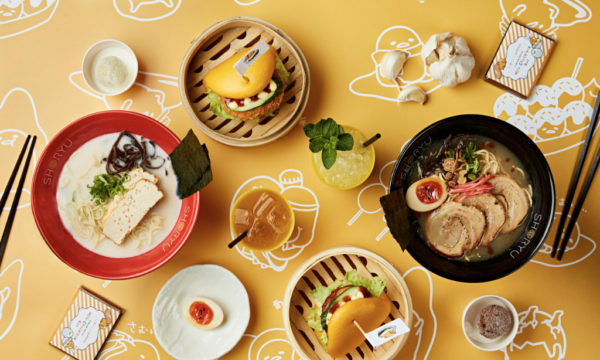 Other country winners include Raw (No.15), winning The Best Restaurant in Taiwan title for a second year, and Ministry of Crab in Colombo (No.25) securing honours as The Best Restaurant in Sri Lanka for a third successive time. Hailing from a family of patissiers, Nicolas Lambert honed his skills training alongside world-acclaimed French pastry chefs, including Christophe Michalak at Hôtel Plaza Athénée in Paris. Since joining Caprice in Hong Kong in 2015, the French chef’s delicate creations and artful plating have earned him a devoted following. His signature ‘La Framboise Reconstituée’ reveals his technical skills as well as his ability to push creative boundaries. Consistently within the top 10 of Asia’s 50 Best, Ultraviolet is an immersive, multi-sensory dining experience that combines gastronomic mastery and theatrical wizardry. 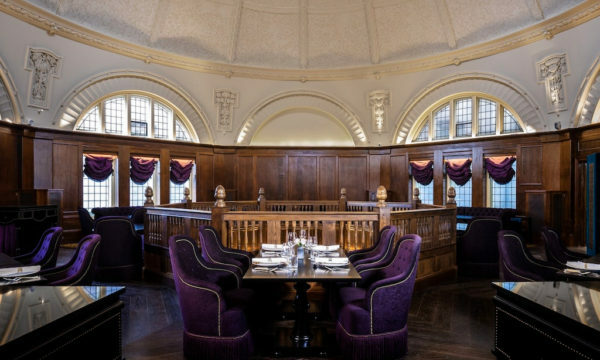 Transported to a mystery purpose-built venue, guests are served a tasting menu in which each course is accompanied by bespoke lighting, visual effects and other senses-stimulating cues. Other award recipients include Toyo Eatery in Manila earning the Miele One To Watch Award for its modern interpretations of Filipino culinary traditions. Celebrated chef André Chiang, of Raw in Taipei and formerly of Restaurant André in Singapore, is this year’s deserving recipient of The Diners Club® Lifetime Achievement Award.